Additive – A compound or substance added to polymer to alter or improve its characteristics such as slip, antiblock, or color pigments. Antiblock – Additive used to give surface of film a rougher texture at a microscopic level. Without additives, film has tacky texture similar to cling wrap. Prevents film from sticking together, or “blocking”. Antioxidant – Additive which prevents degradation and oxidation of material when exposed to ambient air during processing and storage of finished product. Antistat – Plastic has a natural tendency to attract static electricity. Additives put in to dissipate static are referred to as antistats. Backside Treat – Film defect when areas of the untreated/lamination side of film test positive for corona treatment. Barefoot – Polyethylene resins which have no additives, slip, or antiblock. Biodegradable Plastic – A degradable plastic in which the degradation results from the action of naturally occurring micro-organisms such as bacteria. Blend – The mixing of polymers with other polymers, copolymers, or additives to achieve desired physical properties. Blocking – An undesirable adhesion between layers of film or sheeting which may develop during processing or storage. Bloom – Migration of additives such as slip to the surface of the film over time. 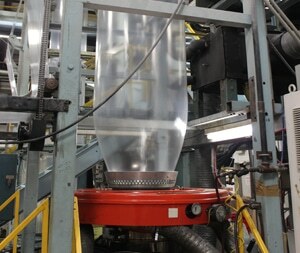 Blown Film – Extrusion of a continuous thin walled tube of plastic through a round die and inflating it to form a bubble. The bubble is then collapsed flat between rollers and slit into layflat film which is wound onto rolls. Blow up Ratio (BUR) – Term used in blown film extrusion that is the ratio of the diameter of the bubble to the diameter of the die. Calcium Carbonate – Mineral based additive used as filler, modifier, and sometimes antiblock agent. Centerfold – Film which is folded on one side and opens on the other. Coefficient of Friction – The force resisting the relative motion of solid surfaces, fluid layers, and material elements sliding against each other. Coextrusion – Extrusion of film having multiple, distinct layers of materials using two or more extruders through a common die assembly. Co-extrusion allows resin combinations to be used to produce films having properties not obtainable through blending in a single layer extrusion. Color Concentrate – A plastics compound which contains a high percentage of color pigment blended with a carrier resin. Comonomer – One of the compounds that constitute a copolymer. Copolymer – A polymer resulting from the polymerization reaction between two chemically different monomers. Core – Rigid cardboard tube onto which film is wound. Typical cores have either 3 inch or 6 inch inside diameters. Corona Treat – The process by which the surface energy of plastic film is increased to allow adhesion of adhesives, inks, and coatings. Dart Drop Test – Determines resistance to puncturing of the film. Measured in grams. Density – Measure of how closely molecules are packed together. Die – A circular steel block made up of an inner and outer ring through which plastic is extruded and inflated into a large tube. Die Gap – Distance between the metal surfaces which form the die opening. Die Lines – Lines in the machine direction of film caused by buildup of oxidized materials on the die. Differential Scanning Calorimetry – Used to measure the melting point of plastics. Different test method that vicat softening point, so different values result. Double Wound Sheeting – Two plies of sheeting wound together. Dyne Level – Measure of surface tension. Edge Wrinkles – Rough cut, or jagged edge followed by a wrinkle extending into the roll. Elmendorf Tear Test – Test to measures the resistance to tearing. Elongation – Usually expressed as a percentage, it is the increase in length of a test specimen when a tensile load is placed on the sample. Such test data is often obtained by equipment such as an Instron during tensile testing. Erucamide Slip – A fatty acid based additive commonly used in polyolefin resins to reduce coefficient of friction. Ethylene C2H4 – The basic monomer building block of polyethylene, extracted from either natural gas or naptha. Ethylene Vinyl Acetate (EVA) – Random copolymerization of vinyl acetate and ethylene. Usually low density polyethylene is copolymerized with various levels of vinyl acetate to achieve a lower melt temperature resin. Ethylene Vinyl Alcohol (EVOH) – Copolymer exhibiting outstanding barrier to many chemicals and gasses. Extrusion – Compressing and melting a plastic material and forcing it continuously through a die. Film – Plastic sheet material usually having a thickness of 10 mil or less. Flame Retardant – Additive compounds used to make a polymer fire resistant. Fractional Melt – Resin which has a melt index less than 1.0. Gauge – Thickness measurement of plastic film, often expressed in mils. One mil equals one thousandth of an inch (0.001″ or 0.001in.). Gauge Bands – Raised regions in the machine direction around the circumference of a roll, produced by winding areas of thicker film in the same place on a roll. Gel – Mass of unmelted polymer or degraded material causing a defect in plastic film. Gloss – Measure of how much light is reflected by a film. Gusset – Folds or pleats put into film as it is collapsed. Haze – Measure of clarity in film expressed in a percentage. Heat Seal – The process of bonding two or more thermoplastic films using heat and pressure. Hexene – Used as a monomer in the formation of polymers, usually LLDPE resin. High Density Polyethylene (HDPE) – Polyethylene resin with a density over .940 gm/cc. Homopolymer – The result of the polymerization of a single monomer, a homopolymer consists of a single type of repeating unit. Hot Tack – Hot tack is a measure of the strength of a heat seal before the seal has cooled completely. J Sheet – Similar to center fold, j-sheet is folded on one edge of the roll and slit in the machine direction on the other side allowing the film to be unfolded. The difference is that the fold is not directly in the center of the film, so the width of the film on either side of the fold is asymetrical when opened. Layflat – Measurement of the transverse/cross direction of film, also known as film width. Light Transmission – Measurement of the amount of light that color pigmented films allow to pass through them. Values range from 100% for clear film to 0% for opaque films. Ionomer – Copolymers of ethylene and acrylic acids that have been neutralized to some degree to form metal salts. Individually Quick Frozen – Freezes bagged meat or vegetables rapidly by exposing it to blast of air at approximately -40° F.
Lay Flat – Flexible polyethylene tubing which has been pressed flat. Linear Low Density Polyethylene (LLDPE) – Polyethylene which has more crystallinity than LDPE. Can be produced with butene, hexene or octene comonomer for a wide variety of properties usually stronger than conventional LDPE. Low Density Polyethylene (LDPE) – Polyethylene of a density ranging from .915 to .929 grams/cc. Machine Direction – Direction the film is being pulled through a machine. Masterbatch – A concentrated blend of slip, additives, or color pigment in a base polymer carrier resin. Medium Density Polyethylene (MDPE) – Polyethylene having a density ranging from .929 to .940 grams/cc. Melt Flow Index – Measure of viscosity or the amount of polymer which exits the die in ten minutes and is measured in grams. Melt Fracture – Extrudate or film having a surface that appears rough and wavy. Melt fracture may be evenly distributed throughout the film or concentrated in some areas only. Melt Index – Grams of a thermoplastic resin which can be forced through a 0.0825 inch orifice by 2160 grams of force in 10 minutes at 190°C. Melt Temperature – The temperature at which a resin changes from a solid to a liquid. Metallocene – Latest generation of resin technology utilizing a metallocene catalyst which is basically tiny particles of positively charged metal ions sandwiched between two rings of carbon atoms that have five atoms apiece. MIL – One thousandths ( 1/ 1000 ) of an inch expressed as (001). The metric equivalent is 25.4 microns. Mono Layer – Film comprised of a homogeneous mixture of one or more polymers blended together in a molten state and extruded through a die assembly to form a film or sheet. Monomer – Small molecule ethylene, propylene, styrene, etc that may become chemically bonded to other monomers to form a polymer. Octene – Comonomer in production of usually linear low density polyethylene. Opacity – The amount of light that is blocked by a pigmented film. Orange Peel – An uneven surface texture of a plastic article or its finished coating somewhat resembling the surface of an orange, see Melt Fracture. OTR – Oxygen transmission rate measured by the amount of oxygen which passes across the film. Polyamide (PA) – Also known as nylon, a thermoplastic used for high strength, puncture resistance, heat resistance, and barrier to certain gasses. Polyethylene (PE) – Resins of various densities produced by polymerizing ethylene gas. Examples are Low Density (LDPE), Linear Low Density (LLDPE) and High Density (HDPE). Polypropylene (PP) – A tough, lightweight, rigid plastic made by the polymerization of high-purity propylene gas in the presence of an organometallic catalyst at relatively low pressures and temperatures. Process Aid – Additives used in the production of plastics to improve extrusion performance and reduce surface defects of film. Polymerization – A chemical reaction in which the molecules of a simple substance (monomer) are linked together to form large molecules whose molecular weight is a multiple of that of the monomer. Polyolefins – Class of polymers made by polymerizing relatively simple olefins, including ethylene, propylene, butene, isoprene, and pentene. Resin – Term for the raw material from which film is made, usually in the form of pellets. Seal Initiation Temperature – Measure of lowest temperature at which the required hot tack and seal strength levels are both achieved. Secant Modulus – Measure of film stiffness. Sheeting – A term often used in the film industry as an abbreviation for single wound sheeting. Actually, a web under 10 mils (.010 inch) thick is usually called a film, whereas a web 10 mils and over in thickness is usually called a sheet. Shrinkage – A measurement of the percent of film shrinkage in the machine direction or transverse direction at a specified temperature and time. Single Wound Sheeting – A single layer of plastic film that is wound on a roll. Slip – Slip is an agent most commonly an erucamide or oleamide added to polyethylene resin to make it lower the films coefficient of friction (COF). Talc – Additive composed of hydrous magnesium silicate, used frequently as a filler or antiblock agent. Telescoping – Roll phenomenon characterized by layers of film sliding laterally in the transverse direction, causing the edge of the roll to have a conical shaped appearance resembling that of a telescope. Tensile Strength – The maximum tensile stress sustained by the specimen before failure in a tension test. Tin Canning – Roll defect appearing as raised ridges around the circumference of the roll resembling a tin can. Titanium Dioxide – A white powder available in two crystalline forms, the anatase and rutile types. Transverse Direction -Cross direction or sideways dimension 90° orientation to the machine direction. Treat – Method of raising the surface energy and to some extent etching of films in order to accept adhesives and inks. Tubing – Blown film is extruded through a circular die which creates a tube of film. When the tube of film is collapsed and rolled onto a core, the finished product is called tubing. ULDPE / VLDPE – Specialized form of linear low-density polyethylene having density between .86 and .90 grams/cc. Ultraviolet Inhibitor – Retards the degrading effect of sunlight on polyethylene. Wrinkle – An imperfection in plastic films that has the appearance of a crease, fold, or wave. Yield – Net weight per 1,000 lineal feet of film.